2 Hikers See UFO That Repeatedly Brightened & Dimmed. 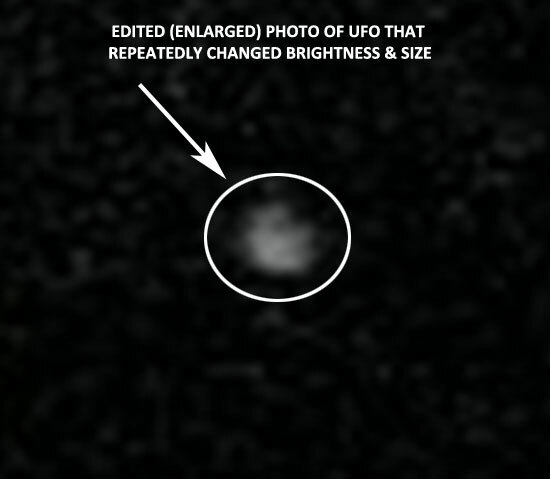 ENHANCED PHOTO TAKEN OF UFO THAT REPEATEDLY CHANGED SIZE & BRIGHTNESS. Description: The witness (Toby) was walking around the Rattlesnake Lake with a hiking companion. They at once saw a bright light at about a 20 degree angle above the horizon to the west. The light became very bright and grew to about 1/4 the size of a full moon. The light would then get dim to the point that it almost would vanish. Then it would brighten again and then dim again. The light repeated this pattern for about 40 minutes. The light was mostly hovering and was moving very little. No sound was heard and some other aircraft were seen in the area. There were a few clouds in the sky and then the sky became cloudy. The light was actually visible through the clouds. The witnesses left the hiking area after about 40 minutes and then returned. At that time the object was observed to be straight up at 90 degrees. At one point during the sighting the witness could see a black outline when the light dimmed. The object was lost when the cloud cover thickened. Some light snow flurries were in the area and temperature was a chilly 37 degrees. The witness remarked that the skies were so bright that they didn’t need a flashlight to see to walk. Note: The witness was quite familiar with aircraft and knew that the object was not a helicopter. (Because there were no flashing lights and there was no sound.) The object was not a planet because it changed luminosity and eventually moved overhead from the west. The object was not a satellite because it didn’t move fast enough. The object was likely not a hot air balloon because it was the wrong color (the color was white rather than yellow-orange which is the colors emitted by hot air balloons). The enhanced photo above does not look like a hot air balloon. Perhaps the object could have been a high altitude balloon? A check of winds aloft showed that winds were from the West to West-Northwest at 10 to 20 knots in the lower 10,000 feet of the atmosphere. The object moved from 20 degrees over the Western horizon to 90 degrees (straight up). A flotation device would move in this direction with a westerly (and light) wind component. Also Google is implementing a program called “Project Loon” where stratospheric balloons will deliver 4G cell phone service to areas devoid of coverage. However, Google is testing these balloons in foreign countries so it is unlikely to be an explanation for this sighting. Also the North Bend, WA area (near sighting location) is close to Seattle and has adequate cell phone and internet service. This entry was posted in black, bright light, circular, Orb-like craft, Orb(s) of Light, Photos, Possible balloon, Possible reflection, UFO Sightings 2015, UFO Sightings Washington, Witness Audio Recordings and tagged Hovering, Slow movement, White lights. Bookmark the permalink. I am the friend of the reporter. I have been wondering if it could have been reflecting the sun while slowly rotating. When I was observing it, it was pretty far to the west and the sun had set fairly recently. Wish I had gone back to watch it again, but I had to work. Thanks for “weighing in” on this sighting. I don’t think that the object was high enough to reflect light. The sun set at around 7:50 PM at the location of the sighting. The object was first sighted at 9:30 PM, but was still visible 40 minutes later and was visible when it moved at zenith (90 degrees). Even satellites are only visible for about 3 hours after sunset or before sunrise. I doubt if this object was nearly as high as a satellite?